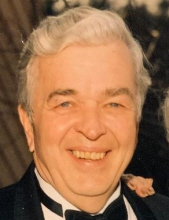 His Legacy…Richard A. Newburg, age 85, passed away February 9, 2019. He was born on December 8, 1933, in Alma, Michigan to Alfred and Kathryn (Strait) Newburg. Richard married the love of his life, Verna Diane U’Ren on June 20, 1953. Richard served as the Director of Corporate Auditing for General Motors for over 30 years. During retirement he enjoyed golfing and traveling. Most importantly, Richard enjoyed spending time with his family, especially attending various sporting events for his children and grandchildren. He will be greatly missed by all who knew and loved him. His Family… Richard will be missed by his children, Mark (Dawn) Newburg, Scott (Katherine) Newburg, Craig (Jill) Newburg, Eric (Amy) Newburg; sister, Patricia (Alexander) Olofsson Jr.; grandchildren, Jessica, Matt, Jason, Luke, Micah, Casey, Jonah, Shanya, Gabe, Eli, Macy, Chloe, Keli, Cassidy, Joshua, and Colby; 11 great grandchildren; many nieces and nephews. He is preceded in death by his wife Diane in 2012. His Farewell… Richard’s Community Farewell will be held on Wednesday, February 13, 2019 at 7PM at Borek Jennings Funeral Home, Hamburg Chapel. Family and friends will gather from 4pm until the time of service. Memorial contributions are suggested to the Alzheimer's Association Please leave a message of comfort for the Newburg family at 1-877-231-7900, or sign his guestbook at www.borekjennings.com. To send flowers or a remembrance gift to the family of Richard A. Newburg, please visit our Tribute Store. "Email Address" would like to share the life celebration of Richard A. Newburg. Click on the "link" to go to share a favorite memory or leave a condolence message for the family.